There are many events where you need the space to accommodate large numbers of people. If you are hosting an audience, holding your event in an auditorium may be your first port of call. While this has the obvious benefits of fitting groups of people in one room – allowing them to all see your event and (if it is a ticketed occasion) increasing the amount of money you can make from sales receipts – there are also challenges. Successfully filling a large room with sound and light can take a little planning. In contrast, the effects of bad planning will leave audience members unable to hear or see – you may even have to give refunds! Take your sound system for example: Bad sound is not necessarily a case of poor volume. Low-quality audio can leave audience members struggling to make out what is going on, even when the volume levels are perfect. The same can be said for your lighting. Many auditoriums are fitted with legacy products, installed from an age when funding was easier to come by and not upgraded since. This can quite easily leave your event lacking and your audience underwhelmed. There is an easy solution: Audiovisual equipment hires combined with expert advice, is what you need to throw a successful event in an auditorium every time. 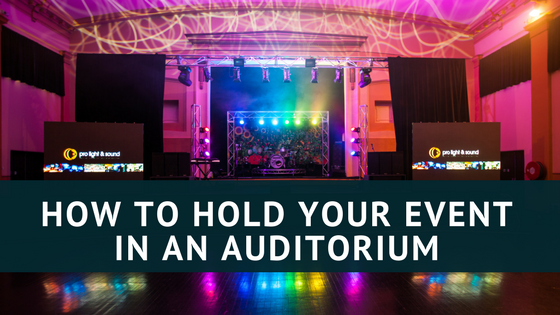 So, what do you need to know about holding an event in an auditorium? Despite the name, many auditoriums won’t be built for optimal acoustics – some will be school halls or other multifunction spaces. Having the right equipment can mean the difference between only the first row hearing what’s going on and every member of the audience hanging on the speaker’s every word. Also, if you are using the space to throw a party, you want to make sure that the music sounds great and really get’s the party going. Afterall, there is nothing worse than investing in a DJ only to find that the speakers are simply not loud enough to dance to. It might be tempting to have a solitary spotlight highlighting whatever may be on your stage, but remember, you can do much more with event lighting. Wallwashers, for instance, are a great way to create indirect ambience. This means they won’t shine directly onto your audience, but will highlight scenery, accentuate features or simply create a colour palette for the room. Are you planning an event in a large room? Talk to the experts at Pro Light and Sound and avoid some of the most common pitfalls.